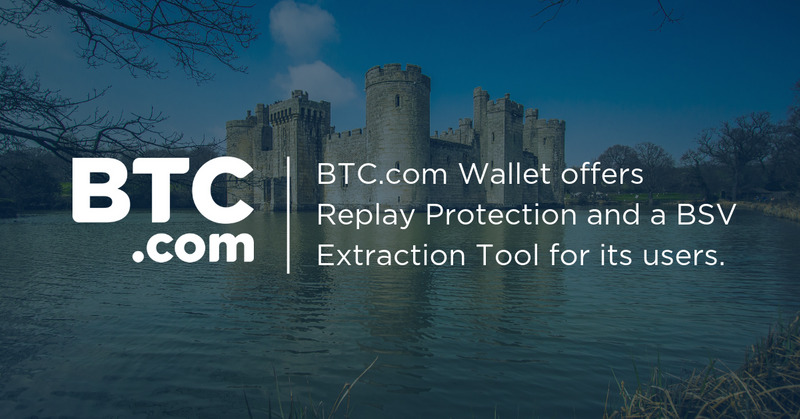 The BTC.com Wallet offers Replay Protection and a BSV Extraction Tool for its users. On November 15th 2018, the Bitcoin Cash (BCH) network successfully upgraded and adopted new consensus rules. This hard fork resulted in a chain split and a new coin: Bitcoin SV (BSV). Follow the steps below, and you will be able to claim your BSV. On November 15th 2018, the Bitcoin Cash network upgrade resulted in two separate chains: BCH and BSV. This upgrade included CTOR and other protocol upgrades to improve on-chain scalability, making BCH more suitable to be used as a global, peer-to-peer digital currency. This upgrade also offers new tools for the developer community, to create a strong ecosystem. We monitored the hard fork, and as announced, the BTC.com Wallet paused all BCH transactions, as there is no replay protection on the BSV chain. We re-enabled BCH transactions after adding a built-in replay protection feature in the BTC.com Wallet. If you own some pre-forked BCH, from before the network upgrade, you will now be able to claim the same amount of BSV. Please read further down, the precise steps to be able to extract your BSV (1BCH = 1BSV) with our BSV Extraction Tool. ⚠︎ The BSV Extraction Tool is only available on your your computer/laptop browser, do not try this on the mobile app. In addition, the recovery runs most stable on Google Chrome. In the first part, we will taint your coins to protect your assets from replay attacks, by sending your full BCH Wallet balance back to yourself. This step is mandatory, to enable you to safely extract your BSV. This is a safe procedure, and your funds will remain in your Wallet as a new transaction. In the second part, we will extract your BSV and send it to your BSV address. Sign in to your Web Wallet and input your email address and password. Click on the drop down menu, and change the Wallet from Bitcoin (BTC) to the Bitcoin Cash (BCH) Wallet. You are now sending your full BCH balance to yourself to taint your coins, enter your Wallet password and click “OK”. Click the checkbox, confirming you’ve tainted your coins (if not, review to Part 1) and click on “Begin Extraction”. Enter the address where you wish to send your BSV — ⚠︎ Make sure this address is able to receive BSV. The BTC.com Wallet does not offer support for using BSV. If you are not already a BTC.com Wallet user, and you wish to claim your BSV now please Import your External BCH Wallet to the BTC.com Wallet to claim your BSV today. Simple Private Key format and enter your WIF format of private key. Press Next. The tool will now search for positive balances in your wallet. You can now send your BSV to a wallet address or exchange address that supports transactions with BSV. The BTC.com wallet does not support BSV transactions for users. You are now able to taint your coins and use our BSV Extraction tool. The prices of BCH and BSV may fluctuate drastically, please evaluate and invest wisely based on your risk tolerance and financial resources. In addition, do not accept or trust any “free giveaways” and stay extra vigilant about impersonators.